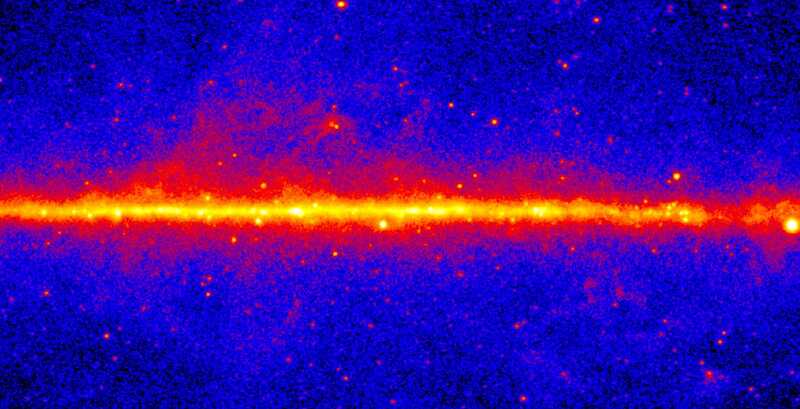 Gleamoscope/Fermi TelescopeThe gamma-ray sky as seen by NASA’s Fermi space telescope. When humans gaze at the stars, we see only visible light – most wavelengths of light are invisible to us, including gamma rays. But NASA‘s Fermi space telescope can see gamma rays, which only the most energetic things in the universe emit. To honour the telescope’s 10 years of discoveries,astronomers devised 21 new (and unofficial) constellations. The constellations feature Albert Einstein, the Hulk, Godzilla, the Starship Enterprise, and other famous “modern” objects. In celebration of a long-lived space telescope that’s mapped an invisible side of the universe, NASA just released a list of 21 modern and unofficial constellations. Space might look like a dark void studded with just a few specks of light, yet this is something of an illusion. What we see is only a rainbow of visible light: a limited slice of the electromagnetic spectrum, and of reality itself. Our human eyes can’t detect “colours” of light that are less energetic than deep red, such as radio, microwave, and infrared. Nor can we see light more energetic than violet, such ultraviolet rays, X-rays, and gamma rays, the most energetic form of light in the universe. But special telescopes can see these wavelengths and render them visible to us. One such observatory is the Fermi gamma-ray space telescope. NASA launched the car-size satellite in 2008, and it has been mapping a normally invisible side of the universe (shown above) ever since then. 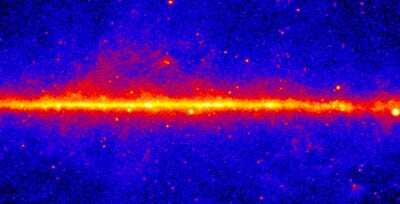 Fermi’s view of the gamma-ray universe has revealed all sorts of objects to astronomers, including never-before seen views of solar flares, cosmic explosions, and other highly energetic and often violent processes in space. So to celebrate Fermi’s 10th year of operation, scientists on the team came up with 21 new – and kind of hilarious – gamma-ray constellations. NASA described the constellations as unofficial, since there are only 88 recognised constellations, according to the International Astronomical Union. Nevertheless, imagining a giant Godzilla, Hulk, Albert Einstein, and even the Fermi telescope itself as a constellation in a normally invisible sky is a mind-expanding exercise. The gamma-ray constellations suggested by scientists run the gamut from silly to storied. In the northern sky, there’s Schroedinger’s Cat (in homage to a bizarre physics thought experiment), “The Little Prince” (from the famous French novel), a Saturn V rocket (teh one used by Apollo astronauts to reach the moon), the Starship Enterprise (from Star Trek), and the Roman Colosseum. Also in the northern sky are the Incredible Hulk, the Eiffel Tower, the Fermi telescope, and a TARDIS (a space- and time-travelling police call box from “Doctor Who”). The southern night sky has its own weird new gamma-ray constellations. Among them is a black widow spider, Mount Fuji, Mjolnir (the mythical hammer of the Norse god Thor), and a portrait of Einstein. You can explore all of the new constellations at Fermi’s interactive webpage. The feature also enables you to see where the constellations are located in the visible night sky, relative to official constellations like Ursa Major, Orion, and Gemini.